If you are allergic to them, you are more than aware of them right now. The itchy eyes and runny noses attest that our native coast live oaks (Quercus agrifolia) are in full flower. They are blooming with a golden haze that makes them hard to miss. Oaks are wind-pollinated and produce copious amounts of pollen to ensure that enough gets to the right place. On years like this when they seem to be outdoing themselves, there is quite a cloud of it wafting through the air. Park your car under an oak for more than an hour and you will drive off with a golden glow, too. 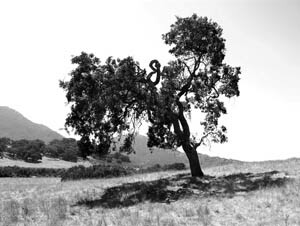 Coast live oaks are evergreen and they inhabit a strip of California about 50 miles deep inland from the coast between Mendocino County and northern Baja. These majestic trees can live to be 200 years old or more and are among the most picturesque of all oaks with their sprawling, gnarled shape. Coast live oaks produce acorns every year, making them a prime source of food for a number of bird species from the acorn woodpecker to the scrub jay as well as squirrels, wood rats, and even black bears and feral pigs. These noble oaks were among the few tree species encountered by early settlers to this region. They stood as sentinels on the grassy slopes and were a major component of the forested canyons and creek bottoms. Their twisted limbs made them mostly unsuitable for commercial lumber production, but they made good charcoal and were harvested to fuel the settlements. The introduction of range cattle also took its toll. As they trampled or ate young oaks, there were few trees growing up to replace their forebears. Even in recent years, conversion of former oak-studded acreage to vineyards has further reduced their numbers. Expanding urban areas are putting more pressure on them, too. Even when builders make an effort to save specimen oaks, the trees may later succumb to the damage done during construction or over-watering of an incompatible landscape. Adapted to our long, dry summers, they are particularly sensitive to water during those months. So, even if they are causing you grief, take a moment to salute the survivors. •Plants are bursting with tender new growth so pests are arriving. Wash off aphids with water, and bait for snails with iron phosphate granules (Sluggo is one brand name). •Start warm-season veggies like tomatoes, peppers, squash, and cucumbers. •Start warm-season annual flowers like zinnia, petunia, ageratum, cosmos, and marigold. •Divide cymbidiums after they finish blooming. Pot up clumps of three pseudobulbs in orchid bark. •Go to the Santa Barbara Botanic Garden plant sale all month long.